How do you make Roman Armour from household items? As you can see from a previous post we have been dressing people up as Roman Legionaries. Just how did we make a full suit of Roman armour from everyday items? Roman Legionaries wore a standard set of upper body armour called Lorica Segmentata, made in sections built from strips of steel, riveted and laced together. A trawl of the internet revealed some good ideas about making a Roman soldiers costume for children, but nothing as ambitious as recreating a set of junior Lorica Segmentata from easily obtained items. We used a number of good published diagrams of the components of Lorica to create a parts list and templates for the strips of armour and cut the sections from stiff corrugated card. The sizes and number of strips in body armour and the shoulder plates were reduced to fit a younger recruit. The whole set of body and shoulder armour was built up in one piece using paper fasteners as rivets. The whole assembly was coated with PVA and then given a burnished steel paint effect. Now for the shields. Not satisfied with the usual suggestion that a plastic cup could be used as a central boss, we managed to make ours from a section of a plastic bottle mounted on a rectangular sheet of card which gave a more authentic look. A bit of research on historic paint colours and a search of the local DIY ‘match pots’ and our shields were ready for battle. Following a suggestion from one website we made a helmet from a cut down hard hat, which worked very well after a coat of PVA and the metallic paint effect. We were so pleased with the end result that we are making a detailed instruction sheet with a pattern, instructions to follow and details of the paints and effects that we used to create our Roman armour which will be available soon. This looks perfect for my son, who’s desperate to create an army! Have you created the instruction list? Our instruction book is still a work in progress, but a draft is available for anyone who wants to give it a go! Yes, we’ll send you the PDF asap. Takes a while to make a full set but worth the effort! Hi, i was hoping you could email me a pdf of the instructions for this? been thinking about making a costume for my younger cousin, and this looks like a perfect thing to do. Hi, I am looking at making some Roman armour to be used in a Christmas play. Would love to receive your PDF of your instructions draft for this amazing project. Our son has been studying the Romans at school this term and a gentleman came in dressed as a Roman soldier (as he does for the kids every year)and our son has now become completely infatuated, so please could I have a copy of your instructions? 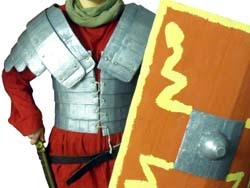 Would it be possible to please send me your PDF instructions draft of ‘How to make Roman armour from household items’. I am doing a report on Roman armor for my high school history class and I would love to be able to make some. May I please have a copy of your instructions? I would love to try the draft instructions. I have a 9 yr old son that is already trying to make his own and this would help greatly! Please could you send me the PDF file for making the Roman armour. As a re-inactor I think this is a brilliant way of getting children involved in history.I wish to make this for my son. I would like to make this costume for myself as our school are having a roman day soon. Could you send me the PDF file for this please. I have laminated silver wallboard paper ready to cut out. Lets hope it works!! I’m helping make Roman armour for a school production and am using your creation as inspiration. So far so good, though I would appreciate having your PDF to help me along. Could I have the PDF for the Roman armour please! Could I have the PDF for the armour please! Hi, the armour looks great! Can you please send me the PDF for this. It would be very much appreciated. Please email me the PDF as soon as possible. I have only just found your site and need the armour by Friday!!! Hi I also need the PDF but for tomorrow if possible???!!! I want to teach about “The whole armour of God”. I’d like to have Roman Armour as a prop. Could you send me your PDF? We, too, would be grateful for your PDF file on roman armour from household objects. Great job! Would appreciate a copy of the PDF as I have to guide my son in making some Roman armour for his school project. Many thanks. Could I please have a copy of the PDF instructions for making roman armour? Hi may I please also have a copy of the instructions it would be awesome to make one! No problem, its on its way to you now. I am just about to embark on making this with my little one for her homework project. Just sent, hope she enjoys making it! My son and I are going as Legionaries for Halloween and a couple other events. I have been getting way into the weeds with the Lorica Segmentata. Your design looks perfect! The simplicity along with the authenticity, so much easier than what I have been doing. Can I, uh, get a copy of the .pdf? I would really appreciate it. Tried sending this to you by email but Yahoo keeps bouncing it back as unknown. Got another email we can use? Hi. Am interested in the Roman armour. Can you send me the instructions? This costume looks absolutely awesome. Trying very hard to make something like this for my son. Could you please send me a copy of your instructions? Please send me the PDF. Thank you! Hi. I love roman armor and was wondering if you could send me a copy of the PDF for both the shield and the Lorica Segmentata. Thanks!! My son is dressing up as a roman soldier for school, would you be able to send me a copy if your instructions. It looks amazing. Please could I have a copy of the instructions for the armour – it looks great! Please can you send me the instructions for making thus armour. Thanks so much. Hi! I have been looking for a long time the easier way to do this kind of armor. would you send to me the pdf. please could you send me a copy of the pdf file . the armour looks great and would be perfect for my daughters homework project…. Please could you send copy of PDF to make the armour for my son. It looks great for how Roman project in school. Hi, this looks perfect for our Roman project! Please could you send me a copy of the PDF? Wow! This looks great – would you be so kind to send me a pdf as well. I would like to make one. Also would be a good idea to post the file itself on site so everyone interested could get it without bothering you to send it via email. Please send me a copy of the instructions for this roman armor. My son is trying to make this and your version is the best we have seen so far. Thank you in advance. My 13 year old son will be playing in a performance about Constantine and we who are involved in developing armor for the soldiers have not settled on a satisfactory solution. In my search thusfar your sample here is the best I’ve seen. I would very much appreciate a pdf of the silver cardboard pieces and any other details on the materials and paint used and how to construct that piece. Could you be so kind as to send me the pdf also? We have at least 6 actors and their moms who’ll be extremely grateful. Hi. looks amazing. Perfect for school play my son is in. Could you also send me a copy of the pdf? Hi, would it be possible to send me a pdf copy of the instructions please, so I can make one for my son’s school Roman dressing up day. Many thanks. very much appreciate it, if you could send me instructions on this. I have been searching for weeks and this looks great. Have ideas but hard to put down on paper for it. Wow, this is great. The kids will be roman soldier on a musical play. Can you send me a copy as well in PDF? Thanks. wod you mind sending me the PDF INSTRUCTIONS also. I need to make a roman soldier costume for a Christmas Program. Hi, can you update your email for us, I have sent the instructions but the email has been rejected a couple of times. Thanks.